I make scales (wood sides for knives), over 2500 pairs since November, 2014. You can find these in my Etsy store, at local shows, or order directly from me. Eventually when I have enough product to warrant $80 a month in fees I will have an online store with a shopping cart and all that good jazz, but this is big enough for now. 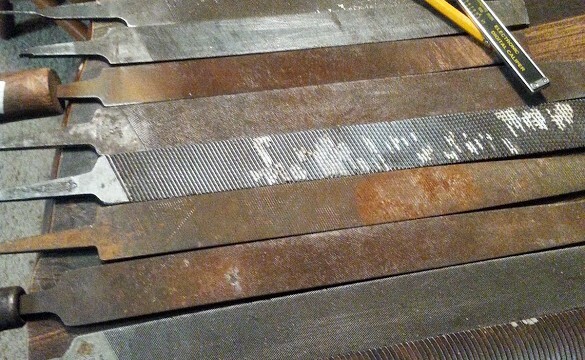 One of the things I recently learned is that many knifemakers who home-forge, like to use old files, bandsaw blades, scythes, leaf springs, and other steel components to use as the blades for their creation. So I thought it would be a good idea to sell files and bandsaw blades and other interesting bits of steel. I also stock antlers, and researching where to buy bulk kirinite and G10 that can be sliced and diced into handle materials. There’s lots of options out there.